Taking the stage alongside iPad Air 2 and iPad mini 3? Is this the big iMac update we've been waiting for? Next month we could see all-new iMacs from Apple sporting OS X Yosemite and a higher-resolution Retina display. 9to5 Mac reports Apple is in the last stages of testing these machines, designed to be the future of Apple's desktop computers. 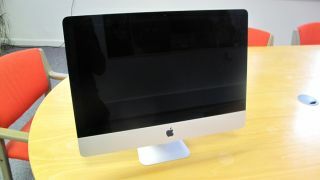 As for the exact resolution of the new iMacs, rumors from September 12 pointed to a 27-inch model with a 5K screen. Meanwhile, code found in the OS X Yosemite beta refers to new display resolutions, specifically 6400 x 3600, 5760 x 3240 and 4096 x 2304. Purportedly these beyond HD resolutions will help media creators on OS X product 4K-footage in the newly improved versions of iMovie and Final Cut Pro. Evidence of a new Retina iMac is mounting weeks before Apple's expected October event. Following the iPhone 6 and Apple Watch reveal, we're anticipate Apple will put on yet another product launch brimming with new devices. Early reports have suggested we will see the iPad Air 2 and iPad mini 3 alongside with OS X Yosemite. This pairing will most likely allow Apple to show off its new Hand-Off feature, which allows for seamless communication between iOS 8 mobile devices and OS X Yosemite desktops. Along with these newly rumored iMacs, rumor has it the Cupertino company will also launch a new Mac Mini. Whatever Apple has planned stay tuned to this space for the latest updates.